Tonsure (/ˈtɒnʃər/) is the practice of cutting or shaving some or all of the hair on the scalp, as a sign of religious devotion or humility. The term originates from the Latin word tōnsūra (meaning "clipping" or "shearing") and referred to a specific practice in medieval Catholicism, abandoned by papal order in 1972. Tonsure can also refer to the secular practice of shaving all or part of the scalp to show support or sympathy, or to designate mourning. Current usage more generally refers to cutting or shaving for monks, devotees, or mystics of any religion as a symbol of their renunciation of worldly fashion and esteem. A baby's first haircut, which is often a head shave, is a common rite of passage in Hinduism. It is called Caula, Chudakarana or Mundana sanskara. Tonsure is usually the part of three rites of passages in the life of the individual in Hinduism. The first is called Chudakarana (IAST: Cūḍākaraṇa, Sanskrit: चूडाकरण; literally, "rite of tonsure"), also known as choulam, caula, chudakarma, or mundana, marks the child's first haircut, typically the shaving of the head. The mother dresses up, sometimes in her wedding sari, and with the father present, the baby's head is shaved and nails trimmed, washed and dressed in new clothes. Sometimes, a tuft of hair is left to cover the soft spot near the top of the baby's head. Both boys and girls typically go through this ceremony, sometimes near a temple or a river, but it is not mandatory in Hinduism. The significance of Chudakarana rite of passage is the baby's cyclical step to hygiene and cleanliness. The ritual is typically done about the first birthday, but some texts recommend that it be completed before the third or the seventh year. Sometimes, this ritual is combined with the rite of passage of Upanayana, initiation to formal schooling. The second rite of passage in Hinduism that sometimes involves tonsure is at the Upanayana, the sanskara marking a child's entry into school. Another rite of passage where tonsure is practiced by Hindus is after the death and completing the last rites of an immediate family member, that is father, mother, brother, sister, spouse or child. This ritual is regionally found in India among male mourners, who shave their heads as a sign of bereavement. Until a few decades ago, many Hindu communities, especially the upper castes, forced widows to undergo the ritual of tonsure and shun good clothes and ornaments, in order to make them unattractive to men. According to Jamanadas, tonsure was originally a Buddhist custom and was adopted by Hinduism. However, Pandey and others trace the practice to Sanskrit texts dated to have been composed before the birth of Buddha, which mention tonsure as a rite of passage. In Buddhism, tonsure is a part of the rite of pabbajja and also a part of becoming a monk (Skt. Bhikshu) or nun (Skt. Bhikshuni). This involves shaving the head and face. This tonsure is renewed as often as required to keep the head cleanly shaven. The purification process of the metzora (one afflicted with tzaraath) involved the ritual shaving on the metzorah's entire body except for the afflicted locations. And as the term tonsure may be used as a broad description for such hair styling of devotees as a ritual symbol of their renunciation of worldly fashion and esteem, Orthodox Jewish males do not shave the corners of their beards or scalps with straight blades, as described in Leviticus 19:27. Some religious groups of Jews do not shave the child's head (mainly a boy) until he is three years old. After he celebrates his third year, the parents take the baby to Mount Meron to a celebration of cutting the hair except the corners of the scalps. The Oriental, which claimed the authority of Saint Paul the Apostle (Acts 18:18) and consisted of shaving the whole head. This was observed in the Eastern churches, including the Eastern Orthodox Church and the Eastern Catholic Churches. Hence Theodore of Tarsus, who had acquired his learning in Byzantine Asia Minor and bore this tonsure, had to allow his hair to grow for four months before he could be tonsured after the Roman fashion, and then ordained Archbishop of Canterbury by Pope Vitalian in 668. The Celtic, the exact shape of which is unclear from the sources, but in some way involved shaving the head from ear to ear. The shape may have been semicircular, arcing forward from a line between the ears, but another popular suggestion, less borne out in the sources, proposes that the entire forehead was shaved back to the ears. More recently a triangular shape, with one point at the front of the head going back to a line between the ears, has been suggested. 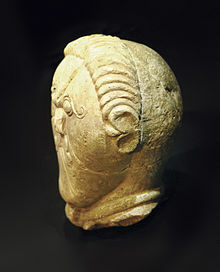 The Celtic tonsure was worn in Ireland and Great Britain and was connected to the distinct set of practices known as Celtic Christianity. It was opposed by the Roman tradition, but many adherents to the Celtic tradition continued to maintain the old way well into the 8th and 9th centuries. Some sources have also suggested links between this tonsure and that worn by druids in the Pre-Roman Iron Age. The Roman: this consisted of shaving only the top of the head, so as to allow the hair to grow in the form of a crown. This is claimed to have originated with Saint Peter, and is the practice of the Latin Rite of the Catholic Church. St. Germanus I, Patriarch of Constantinople from 715 to 730, writes "The double crown inscribed on the head of the priest through tonsure represents the precious head of the chief-apostle Peter. When he was sent out in the teaching and preaching of the Lord, his head was shaved by those who did not believe his word, as if in mockery. The Teacher Christ blessed this head, changed dishonor into honor, ridicule into praise. He placed on it a crown made not out of precious stones, but one which shines more than gold, topaz, or precious stone – with the stone and rock of faith.” In the Eastern Orthodox Church today, priests, deacons, readers, and other tonsured offices do not have their heads shaved. Rather, four locks of hair are clipped from the top of the head in the shape of a cross to mark their obedience to the Church. St. Germanus I writes "The total tonsuring of the head is in imitation of the holy Apostle James, brother of the Lord, and the Apostle Paul, and of the rest." In the Latin or Western Rite of the Catholic Church, "first tonsure" was, in medieval times, and generally through 1972, the rite of inducting someone into the clergy and qualifying him for the civil benefits once enjoyed by clerics. Tonsure was a prerequisite for receiving the minor and major orders. Failing to maintain tonsure was the equivalent of attempting to abandon one's clerical state, and in the 1917 Code of Canon Law, any cleric in minor orders (or simply tonsured) who did not resume the tonsure within a month after being warned by his Ordinary lost the clerical state. Over time, the appearance of tonsure varied, ending up for non-monastic clergy as generally consisting of a symbolic cutting of a few tufts of hair at first tonsure in the Sign of the Cross and in wearing a bare spot on the back of the head which varied according to the degree of orders. It was not supposed to be less than the size of a communicant's host, even for a tonsuratus, someone simply tonsured, and the approximate size for a priest's tonsure was the size of a priest's host. Countries that were not Catholic had exceptions to this rule, especially in the English-speaking world. In England and America, for example, the bare spot was dispensed with, likely because of the persecutions that could arise from being a part of the Catholic clergy, but the ceremonious cutting of the hair in the first clerical tonsure was always required. In accordance with Pope Paul VI's motu proprio Ministeria quaedam of 15 August 1972, "first tonsure is no longer conferred". 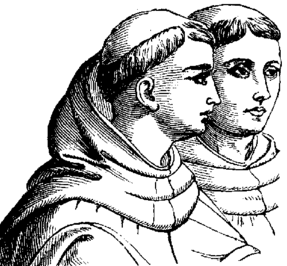 Apart from this general clerical tonsure, some Western Rite monastic orders, for example Carthusians and Trappists, employed a very full version of tonsure, shaving the head entirely bald and keeping only a narrow ring of short hair, sometimes called "the monastic crown" (see "Roman tonsure", above), from the time of entrance into the monastic novitiate for all monks, whether destined for service as priests or brothers. Clerical tonsure (note the scissors in the bishop's hands) of an Orthodox man in conjunction with ordination to minor orders. Today in Eastern Orthodoxy and in the Eastern Catholic Churches of Byzantine Rite, there are three types of tonsure: baptismal, monastic, and clerical. It always consists of the cutting of four locks of hair in a cruciform pattern: at the front of head as the celebrant says "In the Name of the Father", at the back of head at the words "and the Son", and on either side of the head at the words "and the Holy Spirit". In all cases, the hair is allowed to grow back; the tonsure as such is not adopted as a hairstyle. Baptismal tonsure is performed during the rite of Holy Baptism as a first sacrificial offering by the newly baptized. This tonsure is always performed, whether the one being baptized is an infant or an adult. Monastic tonsure (of which there are three grades: Rassophore, Stavrophore and the Great Schema), is the rite of initiation into the monastic state, symbolic of cutting off of self-will. Orthodox monks traditionally never cut their hair or beards after receiving the monastic tonsure as a sign of the consecration of their lives to God (reminiscent of the Vow of the Nazirite). Clerical tonsure is the equivalent of the "first tonsure" in the Latin church. It is done immediately prior to ordination to the minor order of reader but is not repeated at subsequent ordinations. This led to a once common usage that one was, for instance, "tonsured a reader", although technically the tonsure occurs prior to the prayer of ordination within the ordination rite. Since the issuing of Ministeria quaedam in 1972, certain institutes have been authorized to use the first clerical tonsure, such as the Priestly Fraternity of St. Peter (1988), the Institute of Christ the King Sovereign Priest (1990), and the Personal Apostolic Administration of Saint John Mary Vianney (2001). Although the tonsure itself is obsolete, the wearing of a skull cap, called a zuchetto, in church to keep the head warm, which the fuller form of clerical tonsure led to, still survives. The zuchetto is worn by the pope (in white), cardinals (in red) and bishops (in purple) both during and outside of formal religious ceremonies. Priests may wear a simple black zuchetto, only outside of religious services, though this is almost never seen except on abbots, who continue to wear the black zuchetto; save for abbots of the Order of Canons Regular of Premontre, who wear white. Another congregation of Canons Regular, the Canons Regular of the Lateran, wear a white zuchetto as part of their proper habit. Some priests who held special titles (certain ranks of monsignori and some canons, for instance) formerly wore black zuchettos with red or purple piping, but this too has fallen out of use except in a few, extremely rare cases. Some monastic orders and individual monasteries still maintain the tradition of a monastic tonsure. While not required, it is still a common practice of Latin Rite friars, such as the Franciscan Missionaries of the Eternal Word. Some references compare the tonsure to the crown of thorns worn by Christ at the crucifixion. Partial tonsure is forbidden in Islam. Muhammad forbade shaving one's hair on some parts of the head while letting it grow on other parts, as in tonsure. However, shaving the head entirely is allowed. The proscription is detailed in the hadith. Among the Merovingians, whose rulers were the "long-haired kings", the ancient custom remained that an unsuccessful pretender or a dethroned king would be tonsured. Then he had to retire to a monastery, but sometimes this lasted only until his hair grew back. Thus Grimoald the Elder, the son of Pippin of Landen, and Dagobert II's guardian, seized the throne for his own son and had Dagobert tonsured, thus marking him unfit for kingship, and exiled. The practice of tonsure, coupled with castration, was common for deposed emperors and their sons in Byzantium from around the 8th century, prior to which disfigurement, usually by blinding, was the normal practice. ^ Charlton T. Lewis. "tōnsūra". An Elementary Latin Dictionary. Retrieved August 8, 2015. ^ a b c Rajbali Pandey (2013), Hindu Saṁskāras: Socio-religious Study of the Hindu Sacraments, 2nd Edition, Motilal Banarsidass, ISBN 978-8120803961, pp. 94–100. ^ a b c Mary McGee (2007), "Samskara", in The Hindu World (Editors: Mittal and Thursby), Routledge, ISBN 978-0415772273, pp. 342–343. ^ Jörg Gengnagel and Ute Hüsken (2005), Words and Deeds: Hindu and Buddhist Rituals in South Asia, Otto Harrassowitz Verlag, ISBN 978-3447051521, pages 204–205. ^ K. Jamanadas (1991). Tirupati Balaji was a Buddhist Shrine. Sanjivan Publications. The traditional custom of tonsures performed at Tirumalai as religious ceremony can not be viewed upon as a custom of the Brahmanic [Hindu] religion. ^ a b McCarthy, Daniel (2003). "On the Shape of the Insular Tonsure" (PDF). Celtica. 24: 140–167. Retrieved June 18, 2009. ^ In the West, the minor orders were those of porter, lector, exorcist and acolyte, and the major orders were subdiaconate, diaconate and priesthood, with the rank of bishop usually being considered a fuller form of priesthood. In the East, the minor orders are those of reader and subdeacon, (and, in some places, acolyte); the orders of doorkeeper (porter) and exorcist (catechist) now having fallen into disuse. ^ Gregory of Tours, History of the Franks, II.41. ^ J. Hoyaux, "Reges criniti: chevelures, tonsures et scalps chez les Mérovingiens," Revue belge de philologie et d'histoire, 26 (1948)]; J. M. Wallace-Hadrill, The Long-Haired Kings and Other Essays (London, 1962:154ff). ^ See also Conrad Leyser, "Long-haired kings and short-haired nuns: writing on the body in Caesarius of Arles", Studia patristica 24 1993. Saint Germanus of Constantinople (715–730). Meyendorff, Fr. John, ed. St. Germanus of Constantinople on the Divine Liturgy. Crestwood, NY: St. Vladimir's Seminary Press (published 1984). ISBN 0-88141-038-1. McCarthy, Daniel (2003). "On the Shape of the Insular Tonsure" (PDF). Celtica. 24: 140–167. Retrieved June 18, 2009. Robinson, Nalbro Frazier (1916). Monasticism in the Orthodox Churches. Milwaukee, WI: Young churchman Company. ISBN 0-404-05375-0. Sokolof, Archpriest Dimitrii (1899). Manual of the Orthodox Church's Divine Services. Jordanville, New York: Holy Trinity Monastery (published 2001). ISBN 0-88465-067-7. The Great Book of Needs: Expanded and Supplemented (Volume 1): The Holy Mysteries (v. 1). South Canaan, Pennsylvania: Saint Tikhon's Seminary Press. 2000. ISBN 1-878997-56-4. Wikimedia Commons has media related to Tonsure.